Telangana SET-2017 Examination Results-TSSET-2017 Examination Results Subject Wise and Category wise cutoff percentage.TS SET results 2017 is here. Applicants are done with the exam on 20th June 2017 for paper 1, paper 2 and paper 3. Due to High court interim order there is some delay in release of results. 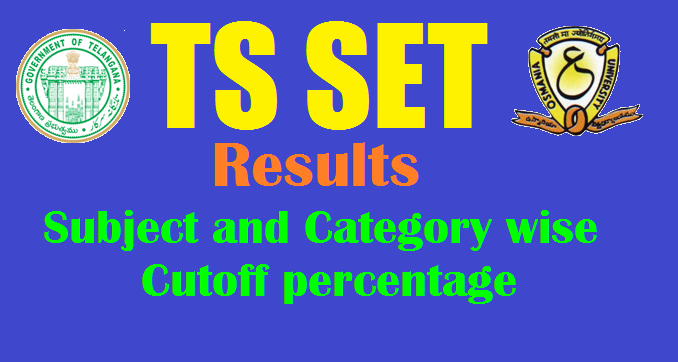 In some days Telangana education department officials will release telangana set 2017 results and also provide you with ts set merit list at telanganaset.org. On 11-06-2017 TSET examination of Telangana State had been conducted for all the applied candidates for the exam. Osmania University will take the complete responsibility for conducting the exam. All candidates who wrote the exam are eagerly waiting for the Telangana SET Exam Results 2017. Here we have a good news for the candidates who appeared for the TS SET Exam 2017, that University is released the results of the above-conducted exam. TS State Eligibility Test Result 2017 will available on the official web which is www.telanganaset.org. Candidates need to follow some instructions for checking their results. Below here we are providing you the procedure for checking the results. Before this interested candidates can check the complete eligibility details required for the posts. The candidates whose Hall Ticket/Roll Numbers are given below have provisionally been qualified through the Telangana State Eligibility Test (TS-SET 2017) for Assistant Professor/Lectureship held on 11th June 2017 subject to fulfilment of eligibility conditions. The results of TS-SET 2017 have been finalized as per the guidelines of UGC, New Delhi and these were scrutinized and approved by the Moderation Committee and Steering Committee of TS-SET 2017. Result release date: 28 Oct 2017. Candidates who have scored well and crossed the cut off mentioned officially i.e General-50%, SC/ST/OBC-40% will be qualified. However there may some adjustments in cut off marks. If two candidates get same marks then sorting will be done based on date of birth and other marks. Candidates be patient and check this site for more updates regarding ts set exam.